11 August 2010. 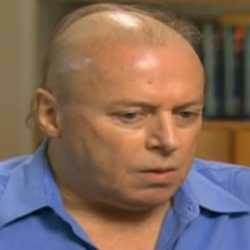 Christopher Hitchens is dying. Aren't we all? Yes, but we're not doing so publicly and we're not able to speak so eloquently about the futility and absurdity of deathbed conversions. "If you hear I've converted," says the Hitch. "Don't believe it." I echo that sentiment. I can't say, as Hitch notes, that some drug-infected or diseased brain in this body might not utter words that could be taken as imploring some god for mercy. But as long as I'm sane and rational, says the Hitch, there will be no change of heart regarding deities or an afterlife. Again, I echo that sentiment. But what about deathbed conversions? Damon Linker of The New Republic thinks they are not to be trusted, but they reveal an essential difference between the believer and the atheist. Unfortunately, neither term has much cognitive meaning in this or any other context. Oh, the terms are jam-packed with emotive significance, but neither denotes anything specific enough to be used for, say, identifying who should be saved and who should be damned. I maintain that the religious believer has only the vaguest idea of what it is he or she believes. Believers have lots of words to express their beliefs, but they all amount to expressions about their feelings. They feel weak, dependent, worried, frail, anxious, fearful, and the like. They are in need of comfort, relief, and hope that someday they will live in glory and power. They long for assurance that the just will be rewarded and the unjust punished. The being that the religious believer calls "God" is the ultimate shape shifter, becoming whatever the believer needs or hopes for. The atheist knows these words well and rejects the idea that they refer to anything real beyond the believer's imagination. Linker has some interesting comments to make about believers who disdain atheists who reject "God" even as they are facing imminent death. The believer sees imminent death as the clearest expression of the cause of all those feelings he identifies with religious belief. Facing death is your chance for religious enlightenment, for seeing just how puny and insignificant you really are. It is the moment you should recognize a need for some Great Power to sweep you away into ecstasy. It should be your moment of total submission. If it isn't, as it isn't for Hitch (and I hope it won't be for me), then you are full of pride and deserve to be condemned for spitting in God's face. This kind of sentimental rubbish actually passes for piety in some circles. ...the terrified, irrational effusions of a man facing his own extinction are no more to be trusted than a blind man’s account of a crime scene: each witness lacks the capacity to perceive, make sense of, and accurately judge the essential facts. Far more reliable are the sober, critical reflections of a man in good health, protected from danger, insulated from threats to his well being. That, for [Primo] Levi and Hitchens, is a man at his best and most capable of determining the truth of things. In other words, the rejection of otherworldly sentiments by an atheist facing death is not a sign of pride but of authenticity and integrity. There is no contradiction between rejecting Abraham's god and recognizing both the insignificance of the individual and the magnificence of the universe. Finally, there are those who think it is agnosticism, not atheism, to admit that it is possible there is some unknowable being or entity who creates universes and has unimaginable powers. Brendan Patrick Keane makes such a claim, despite the fact that it is clearly redundant to say agnosticism is the admission that unimaginable, unknowable beings possibly exist. Agnosticism as a concept with any content means doubt we can know that some particular god in some particular story exists outside of the imagination. Hitch and I reject all the gods in all the stories men tell about their gods, including the one that Jews and Christians claim to believe exists. Such rejection is not agnosticism, even though it leaves open the possibility of some unknown being with super powers existing somewhere in the universe or beyond.